Ok, let's focus here, we're talking food here... man, Committed is talented... but the judges expected more, hmmm, anyway, sorry, food talk. Now I don't have a scientific study to prove it, but I'm pretty sure that smiling cookies always taste better than other kinds of cookies. We got colors, we got sprinkles, and we have one tasty smilin' snowman. Pick these up if you see 'em. I'm going to try not to eat them myself since they are suppose to be for my daughter. Glee Gum! No relation to the show, but it is all natural gum, you know, like it was when I was a kid (gum = gum + sugar + mint). So for 99 cents I couldn't resist). I cracked open the container and boy are these things small. I pop one and start chewing. I read the box and apparently I'm suppose to be chewing two pieces. Well, bad news. First, this is natural gum, really hard natural gum. Second, the mint flavor lasts all of 3 minutes. I even tried chewing three pieces and that didn't help. Oh well, guess that's why we eat un-natural gum nowadays. Oh wait, before I continue, I can't believe I didn't think of this sooner. Now you know I love dairy, and I love crunchy, so it shouldn't surprise you that I love dipping good crunchy oatmeal cookies in ice cold milk. Now I have no idea why I never ever thought of this, or if I did, why I didn't try it, BUT here it is: Have you ever dipped oatmeal cookies in chocolate milk? I tried it and it was excellent! I don't know if I would do this every time, but I definitely won't fear this combo in the future. Ok, one more find for you, and to be honest, I couldn't believe my eyes when I saw this. Now it's been so long I don't remember specifics, but I have found this wacky little candy from my childhood. Here they are! It's been decades since I've seen these little things. 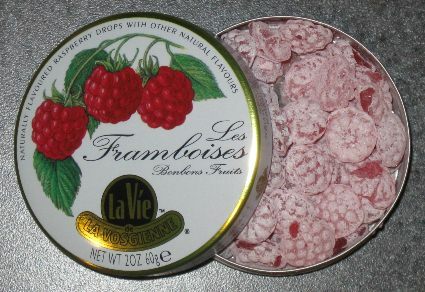 We spent a lot of time in the car as kids, and I can just barely remember this little tin of raspberry candies that I had to keep my sugar level up. I've had a few and they taste just like I remember. Wow, I can't tell you how weird this is for me. You know, I spent most of my time eating penny candy from the local farmer's market, so I've been trying to remember how these things worked their way into my life, but they did. Ahhh, good times, I had to share! I love those little candies! I usually went for the citrus mix over the raspberry, but I remember both flavours being delicious. Glee gum is just sort of meh. I tried it once and was equally unimpressed. Whole Foods stocks a great cinnamon gum in a sort of pill bottle shaped container wth bees on the label. I can't recall the name of the brand, but it's pretty dang tasty and the flavour lasts. I love the wee raspberry candies! When I lived in NYC, I used to hit Economy Candy for them-- all sorts of flavors!